Tom and Darby Hills join Early Learning Center students at Prairie Middle School where they pack food for Barrington Children’s Charities’ “Blessings in a Backpack” program. Tom and Darby Hills join a student who helps pack food for other students. Incorporated in 2008, Blessings in a Backpack is a not-for-profit organization that feeds more than 87,000 elementary school children in over 1,000 schools in 46 states with a goal of providing weekend nutrition to food insecure children who might otherwise go hungry. Here in Barrington 220, students on the Free and Reduced Lunch Program qualify for Barrington Children’s Charities’ “Blessings in a Backpack” program. The program addresses the issue that many Barrington 220 children who are on the Free and Reduced Lunch Program go home for the weekend with no certainty that they will have enough food to eat. Barrington Children’s Charities’ “Blessings in a Backpack” program began in the 2011 school year first benefiting students at Sunny Hill Elementary School. Thanks to the charity’s generous donors and sponsors who participate in their semi-annual fundraisers—Derby Party and Holly Ball—the program was expanded to include all eight Barrington 220 elementary schools and both middle schools. In 2018, Barrington 220’s Early Learning Center was added to the program. Prairie Middle School staff, Barrington Children’s Charities’ members, and program volunteers support Blessings in a Backpack. From left: Peggie Aliperta, Tami Kopp, Lauren Klauer, Claudia Gerard, Molly Canace, AJ Ostrowski, Anne Marie D’Agostino, Aimee Wright, and Patty Parrish. Since the local Blessings program’s inception, volunteers have packed over 90,000 bags to feed Barrington 220 students in need, and this year the packing will surpass 100,000 bags. The program currently feeds over 700 students each week for 33 weeks during the school year. The project of receiving pallets of food items and organizing them for packing takes place weekly at Sunny Hill Elementary School on Thursday mornings. Packing is staffed by PTO and community volunteers. Recently, with the addition of students who qualify for backpacks at the Early Learning Center, students from the Full Instructional and Autism Program at Prairie Middle School assist with packing 125 bags per week for ELC students. There, they help pack a variety of packaged and fresh foods into bags. 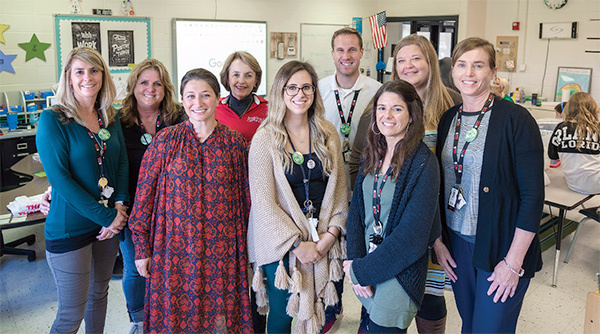 Barrington Children’s Charities partnership with the Blessings in a Backpack organization has gone from one school to all Barrington 220 elementary and middle schools, for children in need. And now, students can find meaning by participating with the packing process, gaining skills, and helping their fellow students. “I am so grateful to have the opportunity to co-chair our local Blessings in a Backpack program. Childhood hunger is a real issue for many of the children in our district and I want to do whatever I can to have a positive and meaningful impact on the well-being of these children,” says Susan Hyde, program co-coordinator. To learn more about Barrington Children’s Charities, visit www.BarringtonChildrensCharities.com. Join Us at Holly Ball 2018! Holly Ball 2018 Co-Chairs Keri Culhane (on left) and Alyssa Pazdan. 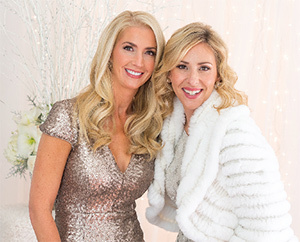 The 8th Annual Holly Ball benefiting Barrington Children&apos;s Charities invites you to its gala to kick off the holiday season in a glowing winter wonderland. This black-tie event on December 8 will be an elegant evening with cocktails, seated dinner by candlelight, and dancing to the band McKillin&apos; It. The evening will be a festive fundraiser showcasing luxurious jeweled treasures donated by Long & Co. Jewelers. Last year&apos;s live auction experience of the first-class Kentucky Derby party for four to watch the Derby live in Louisville will make an encore! There will be more live auction items that surely will make the top of anyone&apos;s gift list. Most importantly, guests will have the opportunity to learn more about BCC and how they can become part of this charity. "There has always been something special about Barrington which is its strong sense of community,” Holly Ball Co-Chair Alyssa Pazdan said. “Barrington Children&apos;s Charities is the epitome of caring for our neighbors and most importantly the children. I wanted to become a part of this charity that not only serves the well-being of children, but also provides the opportunity for us to give back. My hope is that Holly Ball will showcase and inspire the guests to become part of this mission and support Barrington Children&apos;s Charities." Event Details: Holly Ball will be held on Saturday, Dec. 8 at 6 p.m. The event will be at the Barrington Hills Country Club, 300 W. County Line Road, Barrington Hills. Tickets are on sale now for $250 per person. Buy your tickets online at www.barringtonchildrenscharities.com.